Rowan Wick , who captivated State College Spikes fans during an unparalleled power surge as a hittter in 2014, made his major league debut for the San Diego Padres on Friday night as a pitcher to become the 55th Spikes alum to reach the bigs on the Road to the Show, presented by HRI, Inc.
Wick entered the game against the Colorado Rockies in the ninth inning and recorded his first MLB strikeout by whiffing Ryan McMahon for the second out. The Vancouver, B.C. native was called up by the Padres from Triple-A El Paso earlier in the day. Wick had gone 2-0 with a 1.99 ERA and nine saves in 10 opportunities in 20 appearances there. 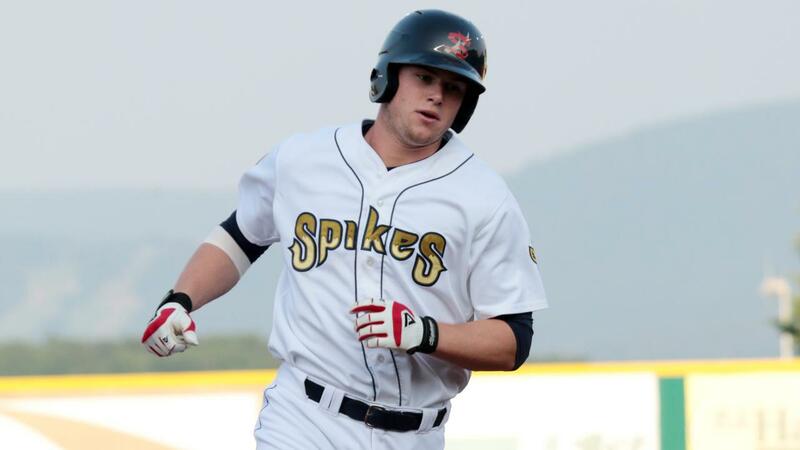 Wick smashed a club record 14 home runs and produced 38 RBI in 35 games with State College, winning the New York-Penn League slugging crown with an .815 mark despite playing less than half the season. However, after struggling at the plate in the higher levels of the St. Louis Cardinals organization, Wick took his strong outfield arm to the mound in 2015 and continued his ascent as a pitcher. The right-hander then reached the 2016 Florida State League All-Star Game with Advanced-A Palm Beach and participated in the Arizona Fall League that year. Wick went on to reach the Cardinals' 40-man roster and moved as high as Triple-A Memphis in 2017 before being selected off waivers by the Padres prior to the 2018 season. Wick also represented his native Canada in the 2017 World Baseball Classic, making two relief appearances. The righty joins former teammates Austin Gomber and Daniel Poncedeleon , as well as 2016 Spikes pitcher Jordan Hicks , 2011 Spikes pitcher Nick Kingham , and 2012 Spikes pitcher Clay Holmes , as Spikes alums to make their MLB debut in 2018. Fans can inquire about seeing more future major leaguers with 2019 Season Ticket memberships and a variety of group packages and experiences for the 2019 season by calling the Spikes at (814) 272-1711.